Sonia Gandhi’s daughter Priyanka Gandhi today jumped into politics formally as congres president Rahul gandhi appointed her as the generaal secretary of the party. 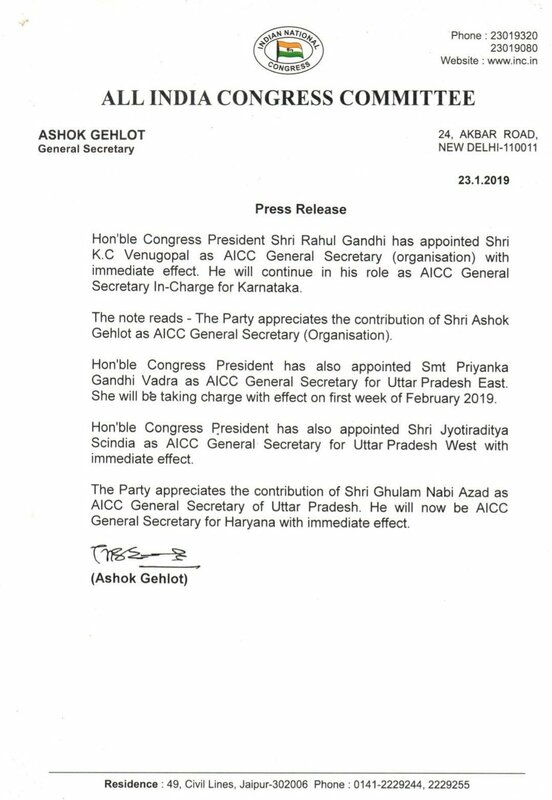 The Congress chief has made his sister Priyanka Gandhi Vadra the election in-charge of eastern Uttar Pradesh, finally heralding her into politics. The choice of east UP, which has not been kind to the Congress during elections, pits Priyanka directly against Chief Minister Yogi Adityanath, who wields considerable influence in the region. The choice of east UP, which has not been kind to the Congress during elections, pits Priyanka directly against Chief Minister Yogi Adityanath, who wields considerable influence in the region. The BJP was quick to seize the opportunity to attack Rahul Gandhi, saying the announcement means the Congress has formally declared him a “failure”. Congress Countering BSP-SP Alliance and BJP in UP | Congress leaders say Priyanka Gandhi’s plunge into active party politics will galvanise the ranks to make them prepared for the massive dual challenge posed by the BJP and the SP-BSP alliance in Uttar Pradesh. Bringing the 47-year-old on board the campaign shows that the Congress is serious in its promise of making the election in UP a triangular contest after the snub from Mayawati and Akhilesh Yadav. Soon after the SP-BSP alliance was announced, Rahul Gandhi had said that he has a surprise in store, but few had predicted it be Priyanka’s political plunge.